SANTA MONICA, Calif. – May 27, 2014 – Whispering Willows, the award-winning original title from Night Light Interactive, is now available for purchase on OUYA for $14.99. The game immerses players in a grim, atmospheric environment rendered in strikingly stylized 2D visuals and ushers them through a mysterious world that plumbs the darkest depths of the human spirit. In Whispering Willows, players take on the role of Elena, a determined young girl with the extraordinary ability to project her spirit outside of her body. In her spectral form, Elena can interact with the benevolent spirits and wicked wraiths that used to dwell within the walls of the sinister Willows Mansion – lost souls, stuck in time and space, who hold the secrets that Elena will need to traverse the terrifying old manor. 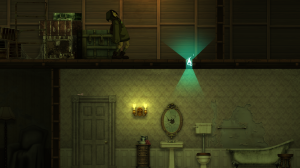 Players need to make use of Elena’s corporeal and ethereal forms to overcome obstacles, solve the riddles of the mansion’s enigmatic specters, and find Elena’s lost father. The game production team is comprised of designers and animators from the Emmy winning Animax Entertainment with an original soundtrack by Steve Goldshein, composer for Rooster Teeth’s viral hit RWBY and Machinima Film Fest-winning Red vs Blue. 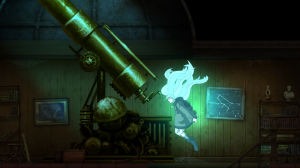 Whispering Willows has already been acclaimed by critics for its stirring story and captivating atmosphere: it won the Seattle Indie Gaming Competition in 2014, and the Cerebral Indie Developer Grant in 2013. The game was also a finalist in the Captivate Conference Game Design Competition and won “Most Immersive” at OUYA’s 2013 CREATE Game Jam. For more info, download the press kit here, or contact TriplePoint PR at ouya@triplepointpr.com. Night Light Interactive is a Los Angeles based independent game studio that produced the beautifully crafted multi-platform title Whispering Willows. The award-winning studio is comprised of over 30 passionate designers and developers, located both locally and internationally, who share the same enthusiasm and dedication for game development. Information regarding their successful Kickstarter campaign and multiple award achievements can be found on their website.